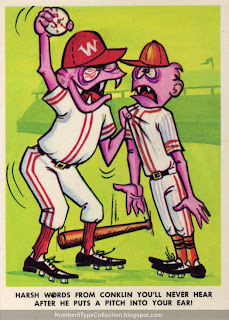 You might think this is another April Fool's Post, but no kidding--it's a real card set from the 1960s. Given today's awareness of head injuries and harsher penalties for throwing at batters, would a 21st century card company even consider mocking beanballs? And what's up with the incredibly bloodshot eyes? "Good old friendly Conk aims right for your ear and never misses no matter how hard you try to duck. 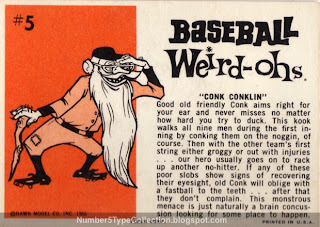 This kook walks all nine men during the first inning by conking them on the noggin, of course. Then with the other team's first string either groggy or out with injuries...our hero usually goes on to rack up another no-hitter." This does raise the question--when was the last time someone tried to (strategically) knock an opponent out of the game from the pitcher's mound? I assume it happened, though maybe not recently. Value: I found this NM card for $2 at an oddball table in 2008, about right for an obscure set not in high demand. Fakes / Reprints: Doubt you'd find any reprints in the market, since they don't picture actual players or teams.